Volunteers are the life-blood of Gulf Coast JFCS. We are proud of the ongoing commitment demonstrated by hundreds of volunteers each year. Whether it’s an ongoing commitment or just helping out at an event, we welcome community volunteers! Events and Office Support provides much needed assistance for community events such as Holocaust Survivor lunches, senior programs, stocking the food pantry, administrative work such as filing and mailings. In Pinellas and Pasco counties, we partner with the Jewish Federation’s Volunteer Central (www.jewishpinellas.org). Volunteer opportunities are posted on Volunteer Central and we encourage the local Jewish community to support our various volunteer needs. To become a volunteer, please contact us at 727-479-1800 or contact the specific program directly. 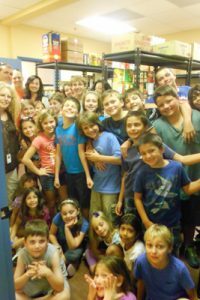 Community Service for Kids engages local youth to support the Food Pantry by conducting donation drives for food, household goods, toiletries and school supplies. These projects can be done by youth groups, religious and pre-schools, and B’nai Mitzvah students. Students can earn community service hours. Be creative and help collect food for the local community! Refugee Services assists new refugees get settled in the area, and provides tutoring and homework help to the children. Set up the apartment, become a friend to a new family! Yad B’ Yad has Jewish adult volunteers become mentors, companions, and role models to a Jewish child. The relationship strengthens the family by enriching their lives with an additional adult influence. Friendly Visitor provides companionship for seniors and other isolated adults, including local Holocaust Survivors. Woman to Woman ensures that teen mothers receive appropriate prenatal care and education on parenting and graduate from high school or obtain a GED in order to become self- sufficient. W2W helps teen moms reach these goals by paring pregnant and unwed teen mothers and their babies, in Hillsborough County with a nurturing community of mentors committed to provide support to the teens in achieving personal growth and program goals. Mentors are matched one to one with a teen and provide support through one on one interaction, monthly workshops and special events. Adult woman, over 21 are needed to join our community and provide support to our young mothers and babies.